Victoria's Inner Harbour is a winding, sheltered waterway with a long history, beginning with the First Peoples, Spanish and English explorers, Hudson Bay fur traders, gold rush participants and more recently, cruise ship passengers. Recreational boaters find moorage within walking distance of the Empress Hotel (seen above), the BC Legislative buildings and a host of tourist attractions. On the walls of the Empress you can see the tracery of ivy vines, leafless now, but soon to be covered in green leaves. The harbour is not just a pretty place, but a working harbour, too. Float planes and ferries take turns coming and going. SALTS stands for Sail and Life Training Society. 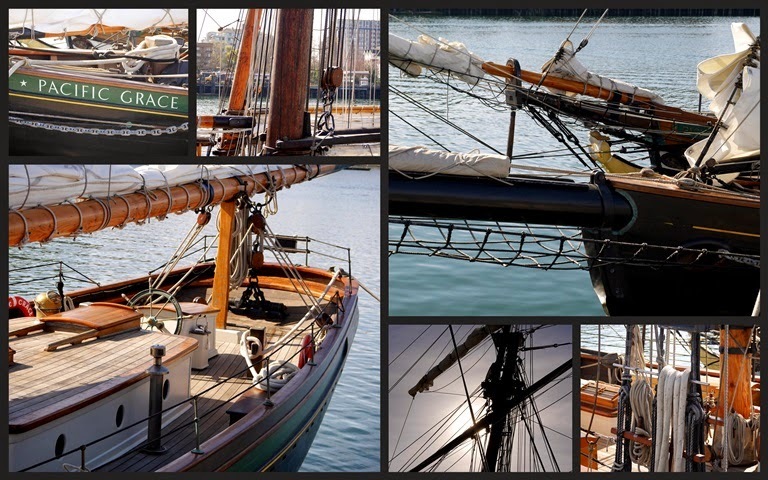 The society owns two beautiful tall ships, the Pacific Grace and the Pacific Swift, seen in the foreground of the first photo. The society exists to teach sailing and life skills to young people (1700 per year) from all walks of life. The Pacific Grace is 115 feet long and has 38 berths. Compare that to the Bounty (of the famed Mutiny on the Bounty) with a length of almost 91 feet and a crew of 46. Tight quarters for a voyage that lasted a couple of years. Lots of opportunities for learning to get along with people. On the Bounty that didn't work out so well. Not everyone wants to sail a tall ship, and these little water taxis are a great option. They have a route along the waterway with stops where passengers can get on and off to see the sights. One of the most beautiful buildings is now the Bateman Centre. It features the art of wildlife artist Robert Bateman. There's also a restaurant in the building. It was originally built as a steamship terminal to service passengers arriving or departing on ships traveling between Victoria and Hong Kong. Such lovely architectural details. When we walked along the water, hyacinths were just coming into bloom. Mass plantings filled the air with fragrance. These blooms have a great view of the water. Tourist season is beginning and it's fun to hear all kinds of languages as we walk along the Inner Harbour. I'm always surprised by how many people mention that they have visited this small city on Vancouver Island. Have you? Linking to Sunlit Sunday, hosted by Karen. We've not visited but it looks like a wonderful place - and not so very far from our house. I love the architecture and of course the water taxi - that would be a lot of fun. Hi Lorrie, I love your photos. Someday I am going to stop dreaming about visiting your beautiful island . . . and just go :) Thanks for the lovely tour. Your photographs are lovely, I like the collages that you put together. We are flying into Victoria April 21 st, renting a car and seeing where we end up over the course of 4 days! Can't wait to visit the area again....always an enjoyable trip. Oh yes I have! And what a lovely tour you shared! A very interesting post, Lorrie! Lovely photos... the harbour is such a beautiful place, and the water taxi looks really cute. The hyacinths are to die for and the hotel certainly is impressive! Alas, no. It's so beautiful! Yes, I have been to Victoria (wink), though I don't get downtown as often as I'd like. It's especially nice in the spring and summer. Yes, many years ago. Such a lovely part of Canada. I enjoyed this post. Yes. We went to Victoria Island for our 25th wedding anniversary. We had plane vouchers for anywhere in North America so went as far as we could go! It was lovely. We love the harbour in Victoria and especially love riding the harbour tugs from place to place. Before I retired I worked with Robert Bateman's niece and some of the paintings in his books are from her family farm. I've never been but it always looks so beautiful! I'd love to see it sometime! And the hyacinths are so pretty, one of my absolute favorite flowers. No I haven't Lorrie, but Victoria looks like a beautiful lively city with lots of activity on the waterfront! The two tall ships are a great attraction for visitors too. I imagine the harbour was a special haven for fur traders in early times. Googling Victoria I read it was settled by the British in 1843, much the same time as New Zealand! Clever planting along the waterfront - what could be more memorable than the amazing fragrance of flowering hyacinths. I'm playing catch up too Lorrie - I've had a busy few weeks! Beautiful pictures. I've never been there but your pictures make me want to visit! Love the water taxi- that would be my speed! Beautiful pics. I can almost smell those blooms! What wonderful picturs, Lorrie. Yes, I think I mentioned that my late beloved and I visited Victoria and the Butchart Gardens. If I ever get the chance to go back, I want to have tea in the Empress Hotel. Oh, how I'd love that! I'll never forget the fabulous view of the harbor, Empress Hotel, government buildings, museum etc. as the ferry pulled in on my very first visit! Since then, on subsequent visits, I've still been overwhelmed by the beauty of the area. I immediately noticed there was no ivy on the Empress in your pic - Bob's been in winter and said he recalls it like that. I had no idea the ivy was deciduous - must be more like Boston ivy rather than English, is that correct Lorrie? I did have afternoon tea there on a later visit, and purchased a painted tile of the hotel. Loved the fabulous Royal BC Museum - took granddaughter Jasmin there for the Titanic Exhibit! Great memories of Victoria and as you know I hope to return. I love Victoria...but it's now a long ways away lol....your photos make it feel like I am walking in the sunshine dodging tourists and cameras with glee. It's so beautiful there. I've not been to Victoria, but have heard that it is a lovely city. Your photos of the harbour point to beauty and history. A harbour stroll would be just the thing to do today! I have returned from my visit to California and savored every moment of it. I am now enjoying my visit here with you today and the spectacular scenery, interesting facts and history along with the sweet smell of the hyacinths. I have not been to Victoria but I had a lovely Aunt and Uncle who told the most beautiful stories of their visits there-I would love to see it in person. Yes, I have visited a couple times and must return soon. It is so beautiful to walk along the Inner Harbour. What a wonderful post Lorrie. It was informative and showed the beauty of the Inner Harbour. So many memories are associated with that area of Victoria. For two summers I wallked past the CPR building to board the Princess Marguerite which sailed to Seattle and I worked at the Empress as well. I love the Inner Harbour! This looks like such a beautiful city. I have not yet had a chance to visit the western coast on Canada. I did see most of the eastern shores of Canada and the eastern cities of Toronnto. Montreal and Quebecwhen I lived in NY.